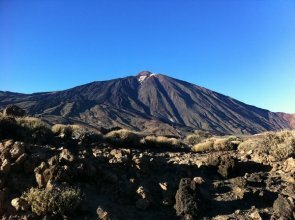 Mount Teide was spectacular and cold. It was 4 degrees Celsius combined with gale force winds at the top of the cable car. We were about mid-way in the inappropriate clothing stakes, having at least taken fleeces to wear with our shorts and sandals. The guys wearing salopettes, anoraks and wooly hats got it about right. First prize went to the girl in halter top and hot pants. Respect. We did one half hour trek to a lookout point, constantly on the verge of being blown over. At the lookout point a wild-eyed crazy guy insisted on getting a picture of himself with our group. I think he just wanted a picture of Andrea's hair so he could show the people at home how windy it was. Tomorrow we head back to Gran Canaria.